I am an absolute sucker for glitter. I remember when I was about 13 years old, first getting into make up, and insisting on buying all the Urban Decay glitter eye liners. I was a glitter addict. A few months back I got the chance to try out the Spectrum Noir Colorista range and while I was browsing the website, I found the Spectrum Noir Sparkle Pens catch my eye. When I was offered the chance to try out the Sparkle Pens I jumped at the chance! I was really interested to see how these glitter pens would perform, especially as I was impressed with the Colorista range. 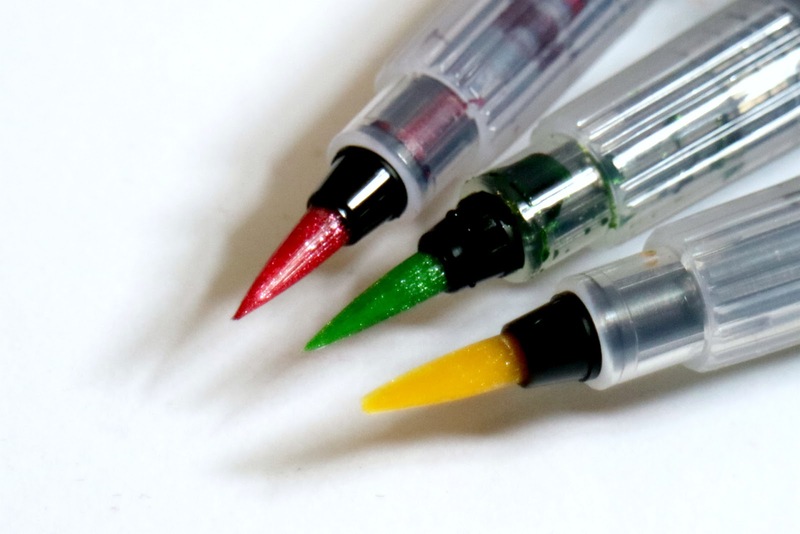 I thought the Sparkle Pens might be better for crafts too - I am a big lover of Christmas so I have visions of these pens being used heavily around the festive period! Spectrum Noir Sparkle Pens are a range of pens that have glitter infused ink. They come in a wide variety of colours and there is even a clear glitter topcoat. Instead of a regular felt tip, the Sparkle Pens actually come with a nylon brush similar to a paint brush to give you more control over the ink (which has the potential to be very messy!). I like using the nylon brush as it almost feels like you are painting, as opposed to using a pen, and with that you get the same control that you would using paint and a brush. It's quite easy to create a gradient or shading effect with these pens. The glitter in these is phenomenal. It really took me by surprise just how much glitter is packed into the ink and it sparkles like crazy. I don't think my pictures could do the glitter any justice, it looks amazing. I cannot wait to use these on cards and for adding sparkles to gift wrap; the Sparkle Pens will really add the finishing touches to any art, craft or colouring book. I did a very quick calligraphy style drawing to show you the glitters. My only complaint with the Sparkle Pens is initially they are quite hard to activate. The ink is a mess, and because of this the pens come with a guard you have to remove then engage the top of the pen with the ink by twisting it and shaking it until the ink goes to the brush end. I probably made it much more messy than it needed to be but I found this stage quite hard, so I kept gently squeezing the ink out the pens to get them started. I do not recommend this - my poor boyfriend ended up with ink and glitter all over his t-shirt! [Note: It did actually wash out which was unexpected but a happy surprise!] Follow the instructions when you first open them, don't squeeze, and you should be fine. I am over the moon with my Sparkle Pens. They are a little pricey, retailing at £12.99 for a pack of 3, however they are worth the price in my opinion. Everyone who loves crafts or being creative in general, whether it be bullet journals, stationery addicts or a fan of colouring books, should own at the very least the Clear Overlay set as you can add glitter to pretty much anything paper with this. 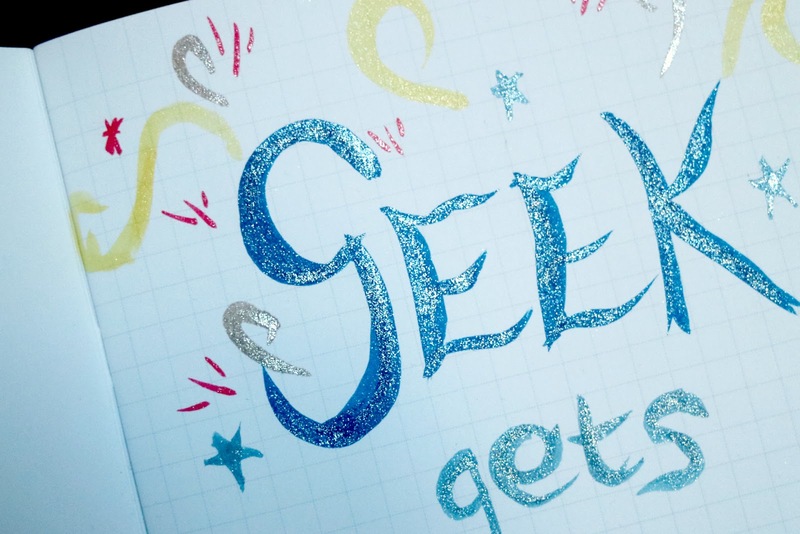 The glitter does not disappoint and it truly makes your work look special. If you'd like to add the Spectrum Noir Sparkle Pens to your collection, you can check out the range at Crafter's Companion. *Disclaimer: This items in this post were gifted for review purposes. Content written by myself, and as always is 100% my honest opinions. 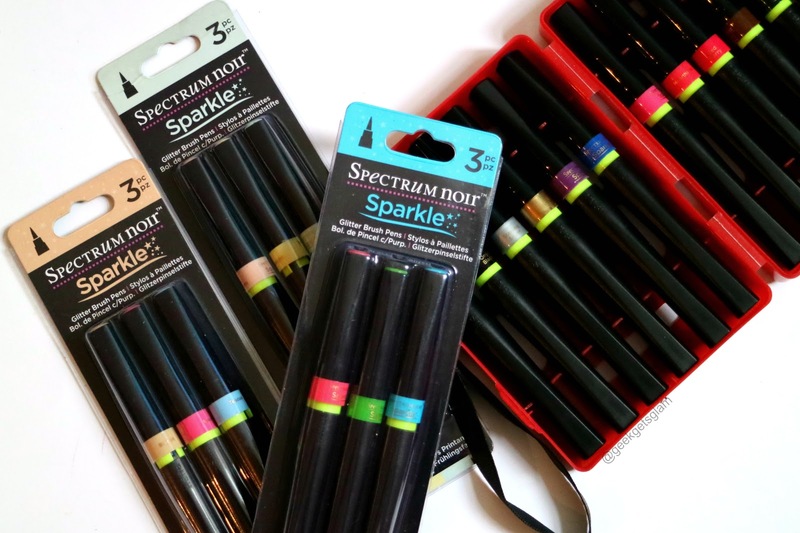 After reading your reviews regarding SPECTRUM NOIR SPARKLE PENS I am thinking to get my hands on this otherwise I was so skeptical about it.Thanks for posting your valuable reviews,it has been always so helpful.